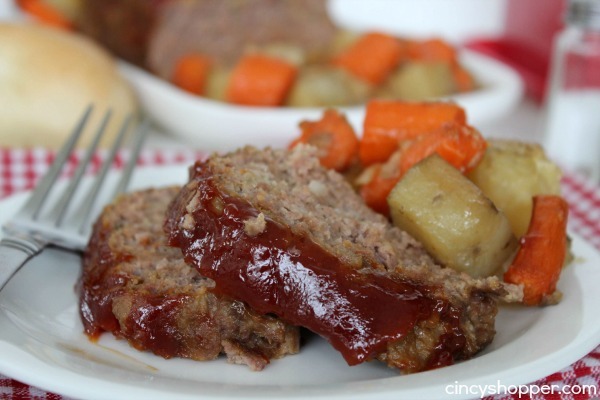 With fall almost here this Slow Cooker Meatloaf Recipe is going to become a weekly meal in our house. This past weekend I was asking the family what they would like for dinner and everyone was wanting meatloaf. I was excited as it allows me to stretch my ground beef further which saves me $$’s. Plus I could use my slow cooker and not heat up the kitchen (a big plus). 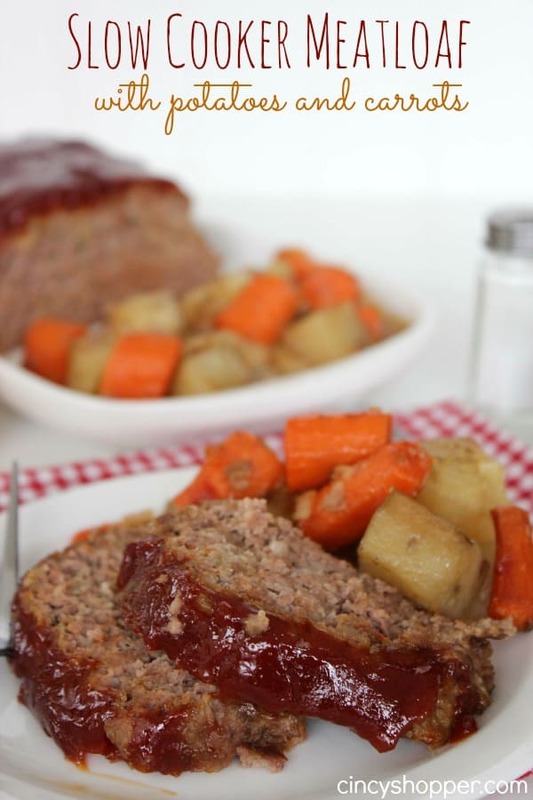 Meatloaf is one of my favorite comfort foods especially when fall arrives. 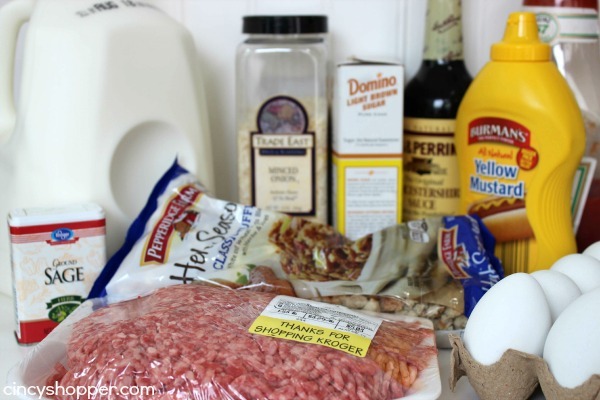 A few weeks ago I shared our Meatloaf Cupcakes Recipe . They were a hit! I was a bit worried about making a meatloaf in our crock-pot. My hubby said there was NO WAY! Ha ha I set out to prove him wrong. To my amazement our Slow Cooker Meatloaf Recipe came out BETTER than the meatloaf I have cooked in the oven. So much better. Oh and it came out looking beautiful too! The potatoes and carrots were a wonderful addition and allowed me to cook everything right in the slow cooker. If you are looking to make a wonderful and tasty meatloaf you will want to whip up this recipe. I do not think I will be cooking meatloaf in the often very often in the future. The whole family kiddos included loved this one. I am thinking I will make two next time and add peppers and onions to the adult loaf. Without them this meatloaf was great but, I am anxious to try those additions next time around. 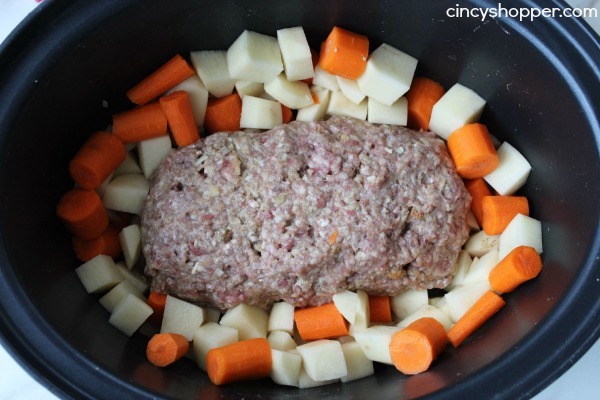 Peel potatoes and carrots; cut into 1" chunks and place around meat loaf. How much of the chopped peppers and onions should I add? Do I add them raw? Yummers! I am trying this! It looks delish! Thank you bunches for linking up and partying with us this week! this looks so good! i will certainly try this! thank you! 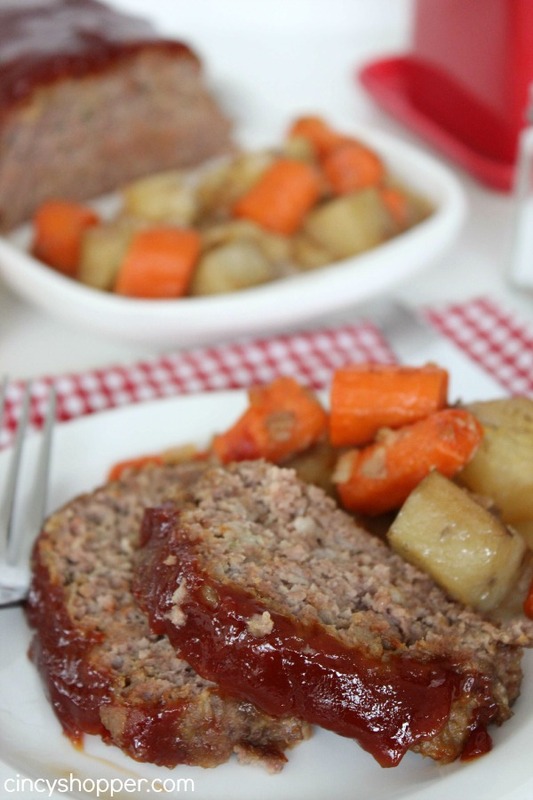 We love meatloaf and would enjoy this recipe! Hope you have a great week and thanks so much for sharing your awesome recipe with Full Plate Thursday. Your post has been pinned with the party! Great looking meatloaf. Thanks for linking up for Friday Favorites. I’m featuring you this week! Hi! This looks awesome. I was wondering about freezing this delicious recipe…. how much cook time would I add and do you think it would still come out ok? I have frozen meatloaf before but I’m a beginner and I would really appreciate guidance! Thank you!! I was wondering How to change it too, I’m guessing you can just add a couple hours? If anyone could comment on that I would greatly appreciate it! Tried this today and it was a disaster. Didn’t turn out at all and had to throw the whole thing away. Followed the recipe but was runny and unable to form a meatloaf. Seems like too much milk for the recipe. Cooked on low for 6 hours and it was nearly raw. Very disappointed. I always cook mine on high. I have the size down from the slow cooker shown. For low, I cook mine for about 10 hours. Great recipe if you really want to try it. My picky 4 year old insists I make this every week! I have lean ground beef. Does it ever turn out greasy? That’s my question too. My burger is 85% lean. This looks so yummy but I’m scared of it all sitting in a vat of fat! just made this and it is a big disappointment. Lots of fat from lean ground beef, the meatloaf is very bland and the veggies that aren’t covered in the fat developed a hard skin. I put the meatloaf in the oven to bake on the sauce which helped a lot – got it out of the pool of fat at least. Put the veggies back in the slow cooker with some water which also helped. But I won’t be making this again! Then spice it up. Use more bread crumbs. My mother told me to go by the rescipe the first time then you can play with it. Looks delicious! Thank you for taking the time to share another delicious recipe with us at the Brag About It Link Party. Pinning! 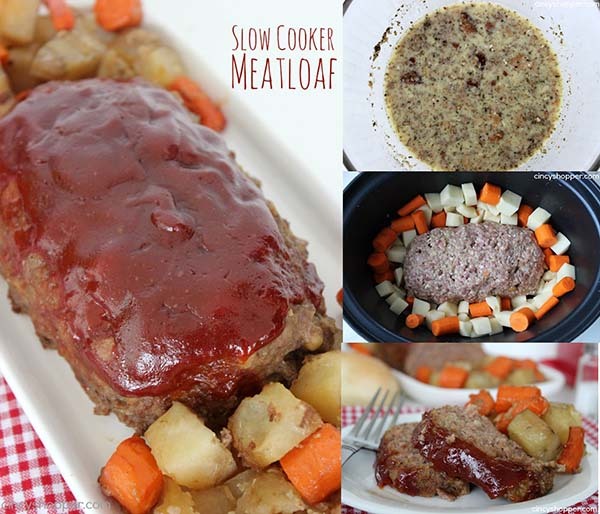 I never thought to make a meatloaf in the slow cooker! Thank you for sharing this. I am also looking to expand my crock pot recipes. Thank you for sharing this at the Home Matters Party! Whoa! I’m surprised by all the negative comments. I have probably made this 5 times and it’s a hit in our house. One of the few dinners where everyone asks for seconds and we never have leftovers. Thanks for sharing. I don’t understand where all the fat and juices go…??? Is it not swimming in the drainage from the ground beef? Excellent recipe. Loved the flavors of meatloaf and veggies. Adding bell peppers and onions to veggie mix is definitely a future experiment to be tried. Saw a similar recipe that used pork for part of the meat, so may try that as well. Thank you for sharing–we are all looking forward to enjoying the leftovers! Sounds like a delicious recipe.Thank you for linking up with us at #HomeMattersParty. We would love to have you again next week. I’m also very surprised by all the negative feedback. I have made this dozen time and made this as one of our regular meals. It’s a big hit! I changed the recipe to use 1 lb hamburger, 1/2 lb of regular pork sausage and don’t put in sage. I will be trying it with bell peppers and onion soon! i, too, am surprised at the negative comments. I make this a lot and it’s such a hit. I use extra lean ground beef mixed with ground turkey and no one notices it. It has great flavor. One I time I substituted panko bread crumbs and it was also great!!! I usually make double the sauce as my family likes to add more when it’s sliced. For those that don’t want it sitting in the grease, just place it on the rack in your crockpot. It holds it up. I also spray my crockpot so the veggies don’t stick. I’ve also substituted poultry seasoning for the sage – great flavor. Love this recipe!!! A family favorite for sure. Thanks for sharing it! Oh no! I just put mine in the pot and after reading the comments I’m totally worried. I also thought the mix had too much liquid, hard to form an actual loaf. I also used 2 lbs. of beef because I didn’t want to have a 1/2 lb. of raw meat laying around. Guess I will kick the crockpot up on high and see what I get in 5 hrs. I just did the same thing you did.. I will put mine on high as well.. how did it turn out…. I tried doing this tonight, and I had so much trouble with it. Making it was no problem. Cooking it proved to be challenging. It is in the oven as we speak, and I hope it comes out very good. 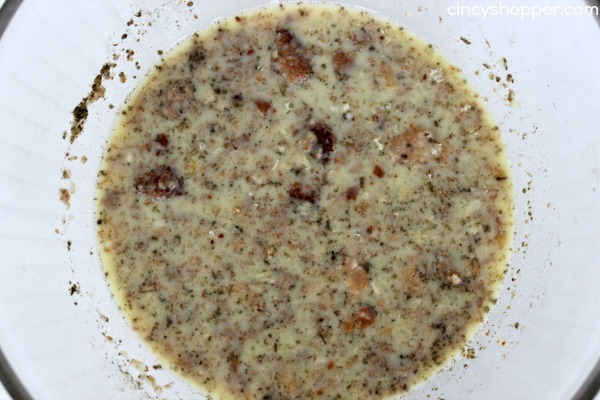 When I put it in the crock-pot, it just sat in it’s own fat, and that is just disgusting. I don’t have a crock-pot rack and our crock-pot is very small. I tried taking the loaf out of the crock pot to put on my drain pan, and it just crumbled and I had to form it again. It might just be cooker’s error, but I don’t know. I am happy others had a better time with this. I will probably just try and cook my meatloaf in the oven from now on. Omg so good! Just made this with ground venison it was so flavorful and amazing..the potatoes were perfectly cooked too. I made 2 adjustments I added 1 tbsp of minced garlic…and some oil to top the potatoes and I put them in first around the edges then put the meat in the middle. I also got the opportunity to use my mom’s homemade ketchup. :) thank you for sharing! I forgot I also used onion soup mix instead of the dried minced onions..I used to make the meatloaf recipe off the side of the lipton onion soup..I had to incorporate it here. Just made this and it was sooo good! I added more salt and some red pepper for a kick. I also was running late so cooked it on high for 4.5 hours and it was perfect! Thank you so much for the recipe it was actually my first time ever trying meatloaf and I was impressed! Haven’t made yet but wanted to share that you can put in rolled up balls of aluminum foil to elevate the loaf. WARNING: If you have a 4 quart crock pot, DO NOT use this recipe. The reason being there are two very big omissions by the author of this recipe. 1) I’m pretty sure she is using a 6 or 8 quart crock pot. This is a HUGE deal. If you use a 4 quart you’re going to end up with a soupy mess. (see above comments of meatloaf swimming in fat). I knew this was going to be an issue when I started putting in my veggies, and after two potatoes there was no room. 2) The type of ground beef she used was probably very lean. Using 80/20 ground beef (fat is flavor afterall) in a 4 quart crock pot results in a sea of fat. Do you think it would fare in a 10 quart crock pot? I have a family of 7! I made this for dinner the other night.The grandkids love it supper moist and it has a wonderful flovor. I was really spectacular about making meatloaf in a crockpot.Tyre out better then what I bake in the oven. Tried this recipe, and here’s what I gathered from my experience. This recipe is definitely made for larger crock pots. If you use a 4 quart then you will end up with the soupy mess that some of you are experiencing. I have a 4 quart, and in the last 30 minutes before applying the sauce I drained all the fatty juices which definitely helped me out. Also, not all my veggies fit in the crockpot. I used one 1 large russet potato and 3 small carrots and the crockpot was very full and crowded. Lastly, you can probably cut back on the milk depending on how lean your meat is. I used 2lbs ground beef+pork and it wasn’t a very solid mix to form into a loaf. Overall, the meatloaf still tasted good. I probably won’t make it again but only because I have a smaller crockpot and it was just too much of a hassle to make. Made this with lean ground beef and use a large slow cooker. After 6 hours, I used a slotted spoon to remove cooked veggies and I put them in a strainer and rinsed off the fat. They taste great. As far as the fat liquid left in slow cooker with meat loaf – I used a turkey baster to pull out the liquid fat. Then I put the ketchup, etc. on the meat loaf. So far, so good. I’m shocked to see negative feedback. I followed the recipe and then added a few twists. I added just a tiny bit of beef broth to the bottom of the slow cooker which helped cover the veggies, I also coated the veggies in Lawry’s seasoning salt. I cook the loaf with the veggies on low for 5 1/2 hours and then cook on high for 2 before adding the glaze/sauce and cook for another 30-45 minutes on high. It has always come out great! Since there are only two of us I always have leftovers…we just take two slices, wrap in foil, wrap in a little saran wrap and then place in a freezer bag. I probably have about 4-6 slices left with some veggies witch leaves me with a few more meals. I will unfreeze them and just heat them up in the microwave on a lazy night. If I want to get fancy though I’ll pair it with my super unhealthy sauteed bacon, onion and red bell pepper green beans (to-die-for!). Made this tonight and it turned out amazing … so delicious! Thank you for sharing! Oooo…I’m going to have to try this. Meatloaf is one of my family’s favorite dinners and I like that I can cook all the veggies with it. Thanks for sharing on Merry Monday. Pinned. Yum! I usually do something similar but with meatballs – this was looks much simpler and so tasty! Thanks for linking up to the Creative K Kids’ Tasty Tuesday; I can’t wait to see what you bring to the party next! 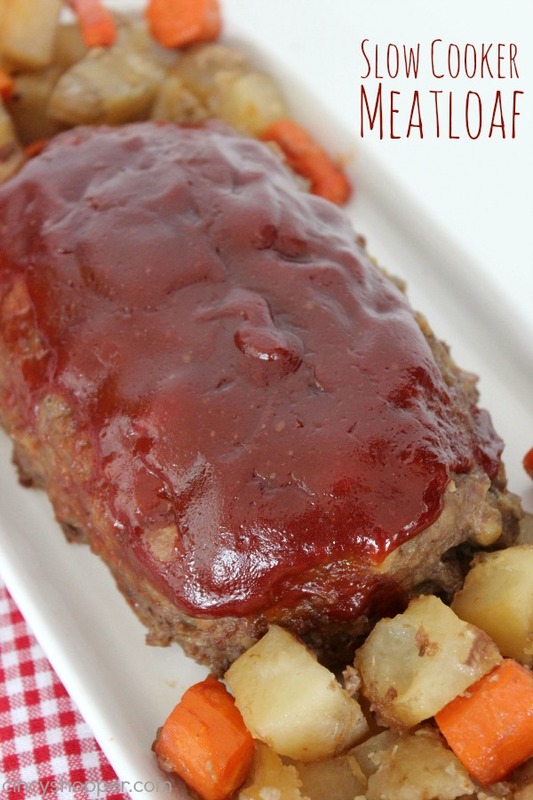 This is one of the best meatloaf recipes I’ve ever made. Thanks for sharing.? Made this tonight and it was amazing! Our 3 and 4 year old both loved it. My grocery store didn’t have a 1.5lbs. The closest I found was 1.3 but was enough. I used 80/20 chuck. Only used half cup milk and little more panko bread than what was called for. I have a 6qt and only cut up 2 red potatoes and definitely not a pound of carrots. Mine turned out great!!! I have a Hamilton Beach slow cooker, not an actual crock pot, so it took another couple hours to cook… may try turning it up on high a little sooner next time. Thanks! This is so delicious! It tasted even better 2 days later! Thank you for sharing. I ended up not following the recipe. I fixed the meatloaf like I always have & cooked on high. It was done in about 3 1/2 hrs. I did add the potatoes but not the carrots. I took the top off the last 30 mins of cooking & then again after I added the topping. I used ground chuck & didn’t have much grease. I used a liner & sprayed it with coconut oil cooking spray before I added meatloaf & potatoes. 1lb beef, 1 egg, chopped onion, worcestershire sauce, saltine crackers,ketchup (last 4 ingredients to taste, we like alot of onion & ketchup), blk pepper, & Red Robin seasoning. I used just ketchup on the top. I’m trying this today. I added a can of vegtable soup to mine, along with crushed garlic. I may have added to many potatoes and carrots though. This recipe is amazing! My family loved it AND as a bonus, my youngest daughter asked for seconds!!! She’s my picky eater, so this was definitely enjoyed by my family. Thank you for sharing this! I made this last night and it came out super delicious and perfect! I think it’s important to use extra lean ground beef that way it’s not sitting in a pool of fat. Even with using extra lean ground beef this came out super moist but stayed together which I was happy about. I also really enjoyed the sweet but tangy ketchup sauce. So good! Definitely a recipe I plan to make again and again!! What can I sub the bread crumbs and ketchup with. Staying away from sugar and grains…. I made this tonight! I didn’t have time to make it in the crock pot but i made it in the oven! 375 for a little over an hour! I made it exactly as said.. but I omitted sage because I ran out. DELICIOUS! I also used 2 lbs of ground turkey instead of ground beef! The topping is amazing too! Great recipe!!! Made this tonight. Loved the meatloaf but by the time the meatloaf was done the potatoes and carrots were still to hard to eat. I had even boiled the carrots in advance. I will make the meatloaf again but will probably just make different sides to go with it. What can I use besides potatoes and c arrots?